Casa de CalMar was funded by a wonderful couple named Cal and Martha. They wanted to make sure that the Feline Leukemia cats at Best Friends had a home of their own and started the funding to make it happen. Feline Leukemia can be a heartbreaker. It can be spread through common contact, so these cats cannot be housed with cats that test negative. For most cats, this is a death sentence. Fortunately, Best Friends is able to house some of these cats and give them the best life possible. Unfortunately, they can only be adopted by those with no other cats or other positive cats....and FeLV will shorten their lives. When my niece and I went to Best Friends two years ago, I made it a point of making sure we volunteered in CalMar. I had been there before, and despite everything that most people think, these cats live wonderful lives. I wanted my niece to be exposed to that. We had long talks about FeLV and what that meant for the cats. And every cat we took on sleepovers that time and this past week were all from CalMar. When we got to Best Friends this trip, our first stop was Cats....I asked her where she wanted to go to volunteer and without any hesitation, she said CalMar. He is super sweet and is a lap is available, he is on it. Unless Pearlene is around....then he is gone. She is the queen of the room - and the smallest cat in it. But if there is an available lap, she would much rather snuggle. She was great on the sleep over and so playful. he will haul his very large self all over you. On our last trip, we did two sleep overs with Harper (here) and one with Foley. About 4 days after we got home from our last trip, my friend who works there called to let me know that Harper had crossed Rainbow Bridge. Telling my niece was one of the hardest things I have done. When we got to CalMar this trip, we learned that in the year following our trip in 2014, Harper's sister Bronte crossed, Foley crossed, and the four kittens (Hewy, Dewy, Louie and Murray) that came in to CalMar on our last day there all crossed as well. FeLV is a heart breaking disease....and yet my niece embraced loving these cats with no hesitation. All animals that cross at Best Friends at buried at Angel's Rest or Angel's Crossing. I knew on this trip that I wanted to make a stop to find Harper's marker. On Sunday, we checked in as volunteers and got my parents off on the tour. And to my surprise, the kid point blank asked me if we could find out where Harper was buried and visit the spot. I had never once mentioned to her that I was going to do that very thing - this was completely her idea. We spoke to an employee, got the information and a map and set off. To keep things from getting too serious, the map wasn't overly helpful and we ended up wandering aimlessly trying to figure out the system. We finally found the right spot. Each site has a stone and a nameplate. Someone (I'm not sure if it is staff or a volunteer) has been making stones with their names. And the colored stones are left by those who visit as a remembrance that these lives will not be forgotten. As you look around Angel's Rest and Angel's Crossing, there are windchimes every where. It is said that as an animal crosses, the chimes ring to announce it. I've heard stories of days when it is completely calm with no wind and as an animal is remembered, chimes will start to ring. That happened for me on that Sunday. There was no breeze as all, but as my niece and I stood and took a picture, the chimes started to softly ring. Both tears and smiles. I feel privileged to read this blog this morning. What a wonderful trip the two of you took, and what wonderful heartfilling volunteering and LOVING you both did. Thank you. Goes to show that one's spirit never dies; it lives on in the wind and the sky. Beautiful! I think I have the whole desert in my eye. I used to volunteer with a group that had a shelter specifically for Feleuk and FIV kitties. Without exception, they were the sweetest most loving cats - at least to humans. Some of them were iffy about other cats. Kittens who are born with Feleuk or who acquire it when very tiny do have shorter lives. I helped foster a group of three and they all passed after about a year. However, my experience has been that cats who live to adulthood or who acquire it as adults can live pretty long happy lives. What a wonderful place for these kitties to live. And a great experience for your niece. This is a wonderful place for the kitties to be able to relax and rest in. 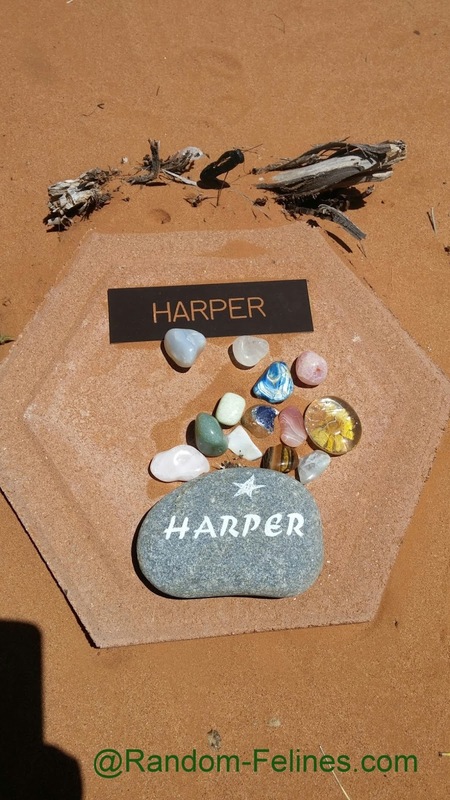 We hadn't seen Harpers marker before and it brought tears to my eyes. A wonderful post, Jeanne, though tissue is necessary....Purrs and peace from my boys. FeLV kitties do not get enough words written about them, and I am so glad you (and your niece) spent time with them at Best Friends, and devoted a post to the experience. What a great story and those cats are so lucky to have people like you to visit them and give them lap time. You made Harper very happy for a little while. How great to go see where she was buried too. That is so great that you visit them all. It's so wonderful that there is a place like this - and good people to give the kitties so much love. I'm glad that some cats with leukemia have a refuge. It's tough to give them a place when they need to be isolated from other cats. Brings tears to my eyes, but I am so grateful for places like Best Friends that give these cats a loving home. Sounds like your niece is taking after her aunt. :-) A rescue group that I follow and support, All Souls Connected, rescued a cat, JoJo, that tested positive for feline leukemia. One of the volunteers took in JoJo and is giving her a good life, no matter how long that is. We love that you and the Kid were able to spend time at CalMar. Thank you for sharing about FeLV; it's a tough disease, for sure. Beautiful post even though it is so sad that FELV is such a killer. I am glad these poor kitties have love in their short lives.